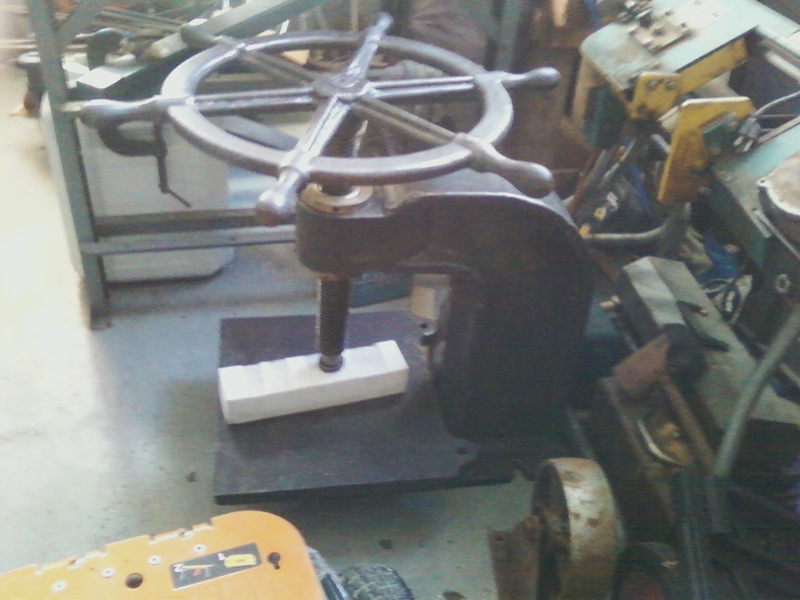 Screw press - The Iron Forge Fire Blackmithing Forum. I have wanted a fly press for a very long time. but mostly they are a little out of my range, but this beauty came my way and now I am looking to see just what it can do. No makers marks, or estimates on age, its just exist as 382 lbs of steel and bronze. 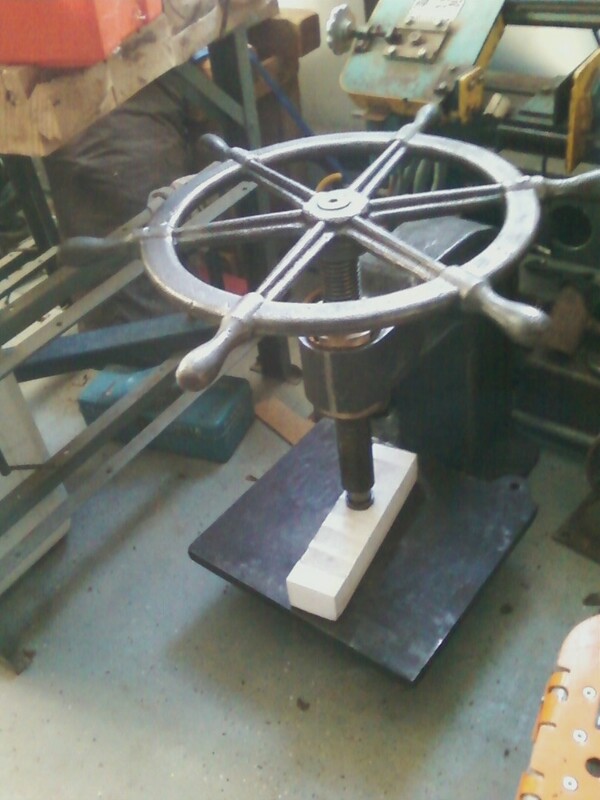 It has a 2" screw that raises up 3/16" and a 26" diameter ships wheel. the wheel and screw weigh 47 lbs. The table is about 15 x 16 inches, with 10.5" daylight from the face to the top of the screw opening. I calculate it should give a 435:1 mechanical ratio minus friction. So with a good stand, I could easily crank 100 lbs of force making this a 20+ ton press. The trick is reducing the friction and making a ram for tooling. It almost looks like the table could be removable to allow drifting as it looks like the table has a giant plug that fits into a round opening for the screw press, but as is, its pretty snug in there and I am not sure by what means if not just from corrosion. 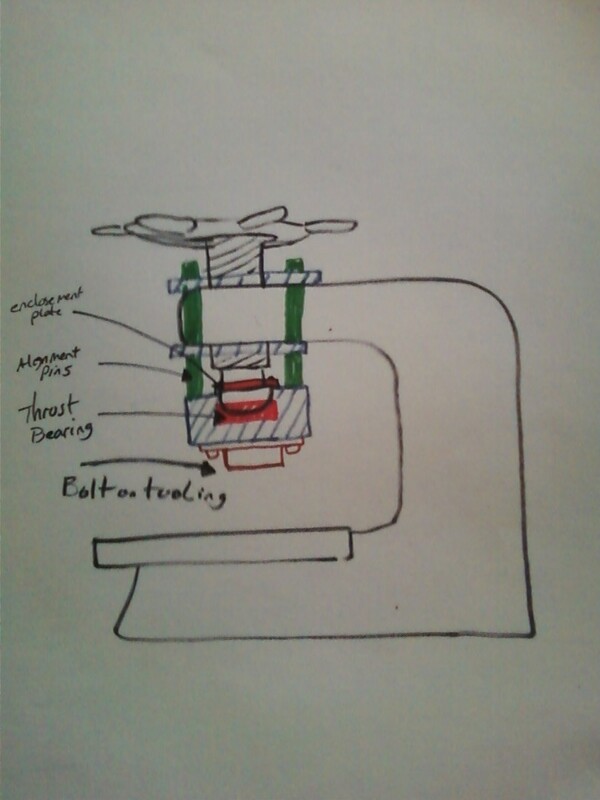 I am looking for ideas and sources for super heavy duty thrust bearings and how to mate it to the domed end of the screw with keeping as much of the 10.5" daylight as possible for work space. I am going to need some machinist help with this but I envision 2 plates at the top of the screw arm, with 4 channels for alignment rods, that will attach to the ram. the ram will need to house a thrust bearing and have plates to catch the top of the nub for raising the screw ram. I am not sure how thick the ram will need to be, or widths yet, I am off to the drawing board but taking suggestions. I also am not sure if I will use a hardly like shank opening for tooling, or try to save space by bolting them to a wider face plate. Nice. I watched a demo where a guy used one of those. Should be a good tool to have. @jcmcustomknives that's good news to me, what did the smith do with it? 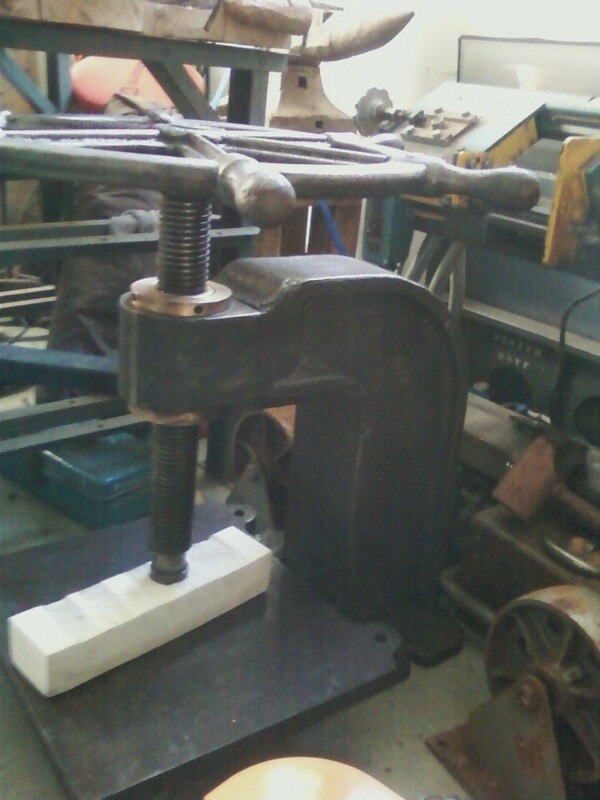 I got it not really knowing if it would have forging ability, or was something like a beefy arbor press for a machinist or like a hydraulic shop press. Idealy I want it to work like a hydraulic forge press to make damascus steel, and flattening, but with a few more applications using the table for bending jigs, texturing plates etc.... I don't think it would do much drawing out very easily without a lot of time inefficiency but still maybe better than I could do on thick stock by hand. @mikewestbrook I am not too familiar with ball joint presses, do you know any examples I can study? when I search for that I get tools for car repair. 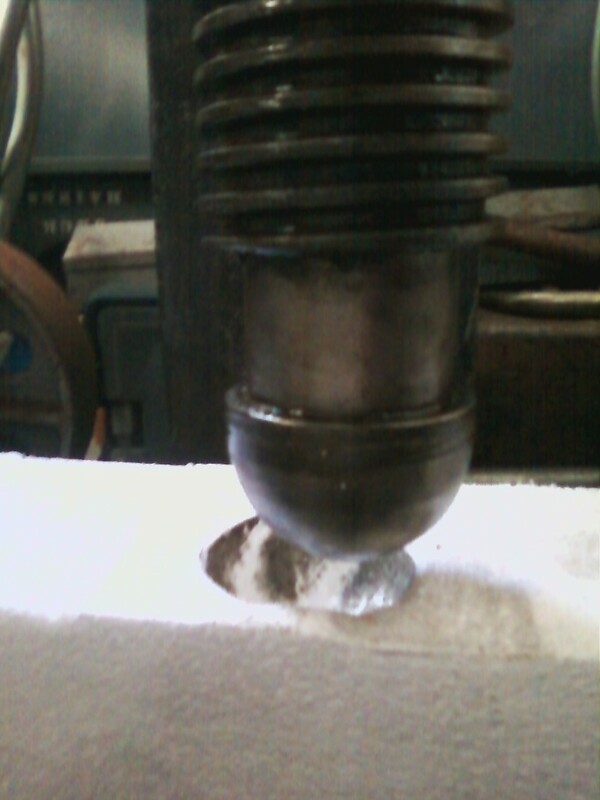 I was thinking I might have a machinist lathe out a seat for a thrust bearing If I can find out small enough and strong enough to take up to 40tons. What i like about your idea is that it goes into the screw leaving more room for work space. As for guide rails I like 4 but I don't see why 2 larger ones wouldn't work either, all it needs to do it keep the ram from torquing once it has made contact and it has to compete with the friction of any bearings. Thank you, this could work much better because of simplicity, probably cheaper, and allow more work room. thanks for your input mike, this may be the route I take, I just need to find a qualified machinist and get a quote.